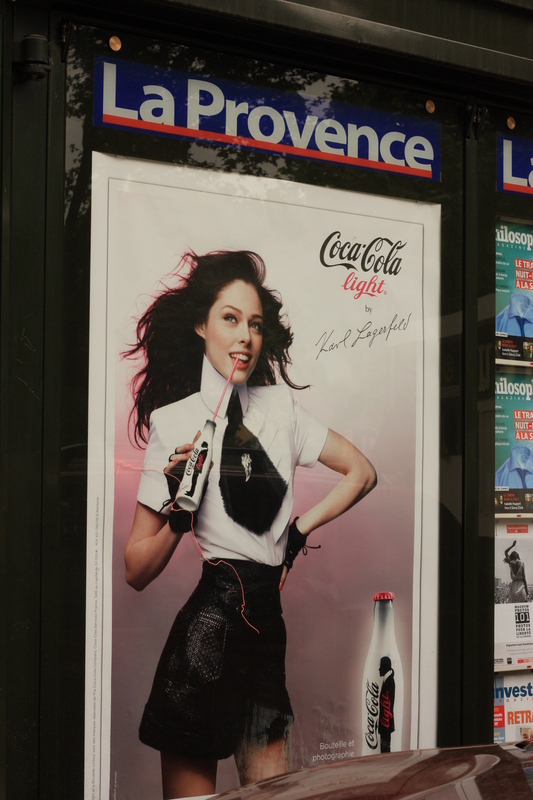 Coca-Cola Light ad pictured on the side of a news stand in the town of Aix-en-Provence in southern France. The news making campaign includes the release of limited-edition aluminum coke bottles featuring the unmistakable silhouette of Chanel designer Karl Lagerfeld. 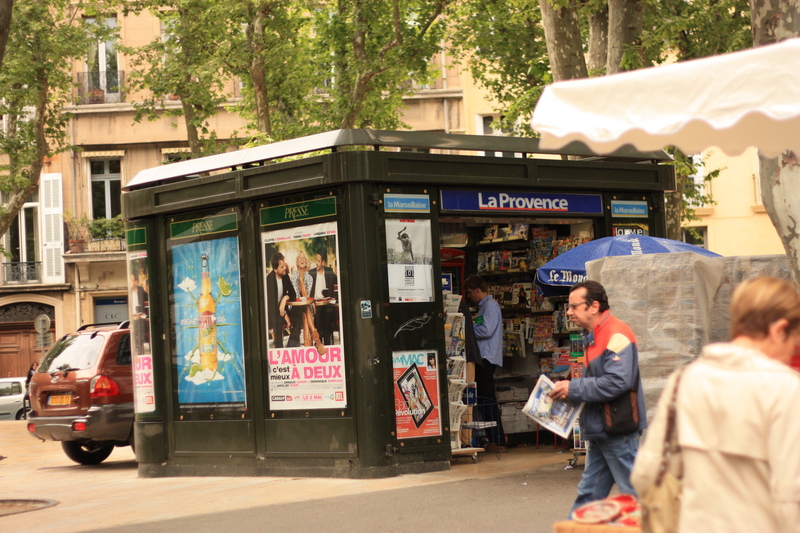 First launched at the end of April, the ads, shot by Lagerfeld himself, have since rolled out in magazines and on the sides of bus stops and newsstands throughout the country. When I first read about the campaign in WWD, I thought it was simply a fun idea, but I had no idea of how elaborate the displays would be on the street. In a country where food and fashion are central to daily life, it’s only natural that the two worlds would collide. 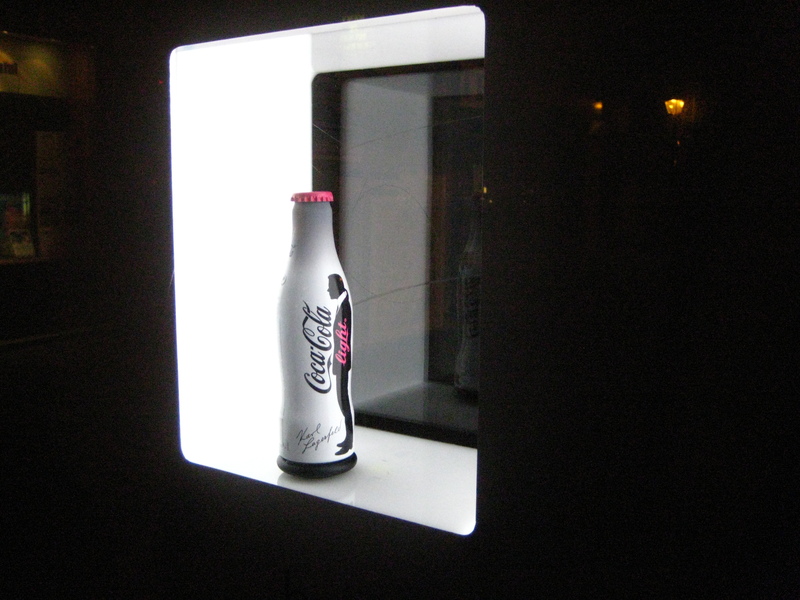 Now, if only American Coca-Cola execs would take a cue and recruit, say, Tom Ford, to do the same! 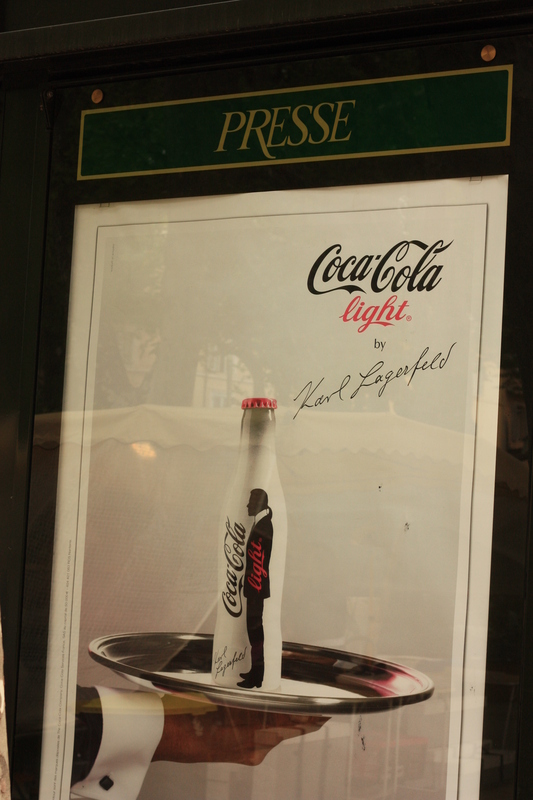 One of Lagerfeld's Coca-Cola Light bottles framed and back-lit inside a glass case embedded into the wall of a Parisian bus shelter. Additional ads feature Canadian Supermodel, Coca Rocha, styled in a feminine version of Lagerfeld’s iconic black-and-white look. Individual bottles or the boxed collector’s edition can be purchased at the famed Parisian concept store Colette— an absolute must-visit in Paris for any fashion follower. Speaking of Tom Ford, did you see A Single Man? I loved it. I probably drank Diet Coke while watching it–it’s my big movie theater indulgence. No, haven’t seen it– yet! But been meaning to. I’m so curious about Tom Ford’s crossover skills to film. Colin Firth is also one of my favorites too. I’ll be sure to drink a Diet Coke while watching it in your honor.